coordinator (PCC) that is your advocate and works with you to develop your own individual treatment plan. This counselor becomes your “go to” person helping you to get your needs met while you are in treatment at Recovery Ways. 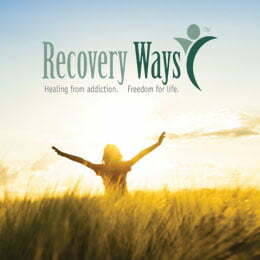 Recovery Ways utilizes a bio-psycho-social-spiritual model of treatment that provides each patient with the emotional, physical and spiritual tools needed to achieve a productive, joyful, and sober lifestyle. At Recovery Ways, we take pride in helping our patients through complex issues of their life including: co-occurring disorders, medical issues, continuum of care services and treatment outcomes.